With the fake suppressor removed, the barrel underneath is exposed. Total barrel length is 12 inches. 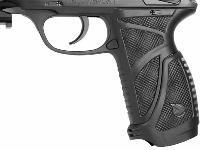 The exposed barrel shown above is 7 inches. 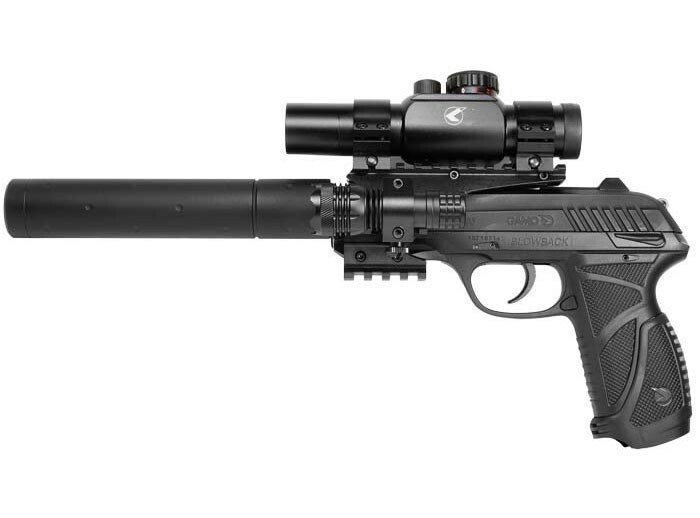 You can shoot the gun with or without the fake suppressor attached. 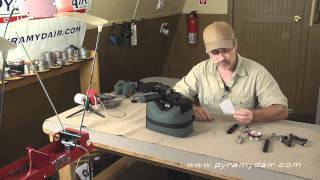 Read more about the Gamo PT-85 is Dennis Adler's Airgun Experience Blog. 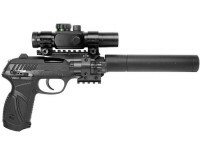 Gamo's PT-85 Blowback Tactical CO2 pistol is loaded with lots of features and accessories. The tactical flashlight and laser sight mounts fit Weaver and 3/8" dovetails. 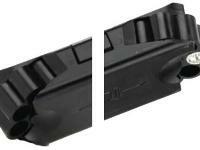 You can easily attach either to another gun that has one of these dovetails or rails. 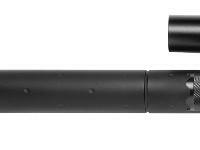 The 80-lumen tactical flashlight uses one CR123 battery (included). It has an aluminum body and a tactical bezel. The momentary remote switch has an 8" coiled cord. 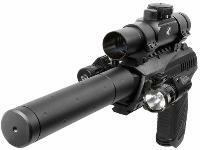 The 650nm red laser sight is a Class 3A with 5mW output. 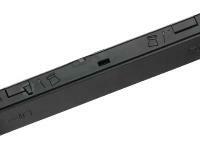 It uses 3 LR44 lithium batteries (included) and has a composite body. The momentary remote switch has an 8" coiled cord. The laser has a range of 100 yds. with indoor lighting and an outdoor nighttime range of 300 yds. It comes with elevation adjustments. 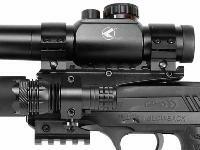 The 30mm dot sight has red, green and blue dots. It uses one CR2032 battery (included). The rheostat has 11 adjustment settings to regulate the brightness of the dot. You can also adjust windage and elevation. Things I liked: Feels balanced in my hand. Looks impressive. Things I would have changed: I would not change anything. Gamo recommends PBA pellets. 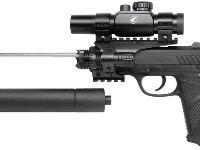 can you use other .177 caliber pellets in this or does anyone know for sure? Why does the Barrow move side to side while holding the rest solid grip??? ??? Probably you just did not screw it tight. 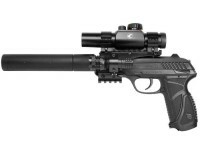 So has anybody using this pistol getting ANY velocity close to the 560fps they claim? I saw there is online video measured the original one with around 330 fps. With longer rod, velocity is slightly faster than original...but I think once I saw a video measured some where close to 450 or 500 fps...cannot recall now... Have not touched this air pistol for a long while because I started playing air rifle, break barrel and PCP.